What is cat head pressing, then? What are the symptoms of cat head pressing? Photography by By TungCheung / Shutterstock. Cat head pressing is something different altogether. 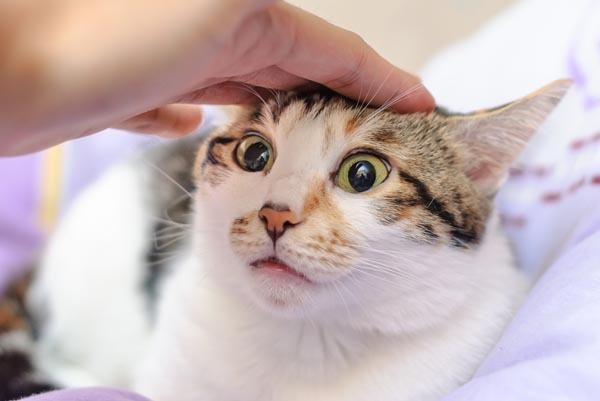 Cats that engage in cat head pressing press their heads against something — usually a wall or a piece of furniture, or in a veterinary setting a kennel wall — relentlessly. They often push continuously and will move along the item against which they are pressing until they reach a corner. At that point they become stuck, with their head pathologically pressed into the corner. Cat head pressing often does not occur on its own. Abnormal vocalization may occur. Cats may be noted at other times to walk continuously in circles, usually only in one direction. They may suffer from disorientation and other weird behaviors. Their pupils may dilate and constrict at unpredictable intervals. Seizures may occur. Head pressing is a manifestation of a neurological disorder. Specifically, cat head pressing and the symptoms that go along with it usually are caused by problems with the central nervous system. In other words, head pressing occurs when something goes wrong with the brain. I am sorry to say that cat head pressing is serious business. Most of the causes of head pressing are big deals. Some form of intoxication is the best case scenario when it comes to cat head pressing. When I say intoxication, I mean it both colloquially — I have seen cats engage in head pressing after exposure to alcohol, marijuana, and prescription or illicit drugs — and literally. 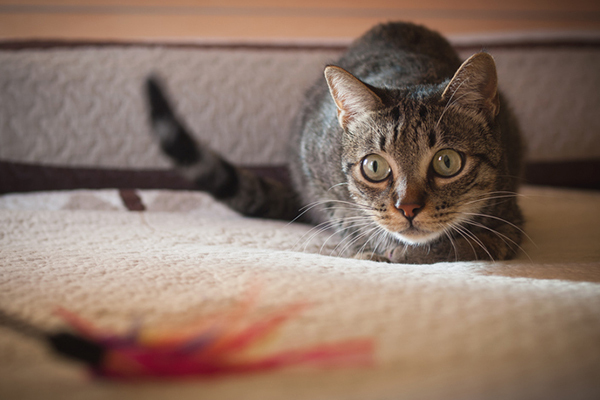 Some cats will react to certain potential toxins such as cheap flea preventatives, lime-sulfur dips and amitraz (an anti-parasitic drug that is used in dogs and to which cats are sometimes accidentally exposed) with disorientation and head pressing. 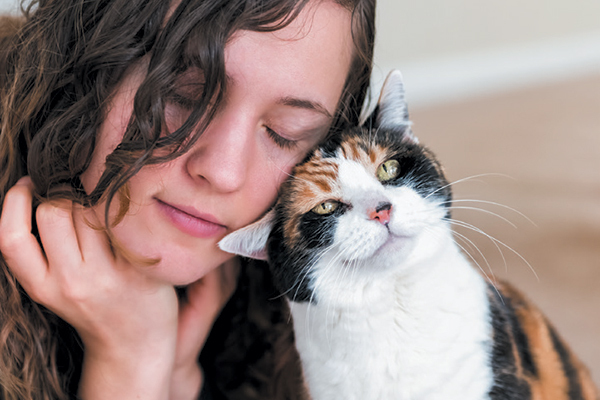 Less perniciously, cats who have received tranquilizing medications or who are recovering from anesthesia in a veterinary office may exhibit temporary head pressing. Although fatal intoxications are possible, most such episodes can be treated with no long-term consequences. Other causes of cat head pressing are more worrisome. Cats with encephalitis or neurological manifestations of FIV/feline AIDS, feline leukemia virus and feline infectious peritonitis may suffer from head pressing. Brain infection with toxoplasmosis may lead to the condition as well. Hereditary brain anomalies also are common causes of cat head pressing. Certain metabolic and glandular conditions can affect the brain and cause cat head pressing. Liver disease can lead to a condition called hepatic encephalopathy; head pressing is common among cats with the condition. Similarly, kidney disease can lead to renal encephalopathy. Unregulated diabetes can lead to a condition called ketoacidosis, or to another condition called nonketotic hyperosmolar syndrome. Either can affect the brain and lead to head pressing. Over-treatment for diabetes, in which cats receive overdoses of insulin, can lead to low blood sugar which also may trigger head pressing. Finally, there is the 800-pound gorilla in the room that cannot be ignored. Cancer — in the form of brain tumors or brain infiltration with lymphoma — is one of the more common causes of cat head pressing. That’s a lot of scary information. If you notice cat head pressing, take your kitty to the vet. But you should not panic. Although many of the conditions that cause head pressing are serious, not all of them progress rapidly (and some of them — the toxicities— may resolve completely). I have known many cats who intermittently head pressed for years without developing other symptoms that compromised their quality of life. Thumbnail: Photography ©krblokhin | Getty Images. Tell us: Have you ever dealt with cat head pressing? My Siamese engaged in head pressing. It turned out to be a sign of excruciating pain caused by a heart worm. She was admitted, treated and went on to live a long life. My cat was diaggnose with skin cancer when she was aroung 5 years old. She is now 19 years old and the last two days she has been head pressing againt walls, corners and i have to pick her up and move her sometimes. This morning she peed in three spots on my first floor town house in stead of going to the second floor where her litter box is. I also put her on CBD oil about 1-year ago to help with the cancer. I do have an appointment with my VET on Monday 8/20/18. Do you have any information / suggestions that i can do to help her until I get her to the Vet’s office. Good luck with the vet and sorry to hear your kitty isn’t doing well. What if your cat only presses their head against something while sleeping. Would this also be a cause for concern? We would discuss this with your vet. If you can, try to get a photo of how your cat sleeps and bring it to your vet visit so you can show him. So my cat likes to pull the cabinet door open and press her head on in while drinking from her bowl. Her water bowl sits on floor just a few inches from the bottom cabinet. Any advice? She has been to the vet recently with lots of bloodwork and urinalysis done for a possible hyper thyroid. We would keep in contact with your vet, but it might be worth trying a behaviorist as well. Best of luck! my cat continues to drag but on floor, glands been cleared,no worms. Now headbutting on left side. unsettled behaviour. blinks in left side. and seems disorientated. I am waiting for a call from my vet to discuss this. what can we do now. I would like an xray and or blood tests. would this show us what is wrong with Jessie ? Please note that this is an advice column, rather than an answer box with questions that go to the vet. We advise taking your cat into a vet so that he can properly diagnose your kitty. Best of luck!